This is a Flex component and is called HTMLForm. How is this component helping? In HTML we have <FORM> which will send HTTP request with all data of all its child controls to the URL specified. In case of Flex application, developer has to access the controls using their ids and add the values to an object and send the request, which is excellent. But for those who just want to post all data to server like a HTML <FORM> HTMLForm component will help. It’s very simple, all you have to do is to add your controls as children of HTMLForm component and set the URL to the httpActionURL property. You can download the sample below. On the server side, you should be using the id of the control to retrieve the value entered by the user on the client. For example if you have a TextInput with id userName, on the server you can use request.getParameter(“userName”) to retrieve the value entered by the user. 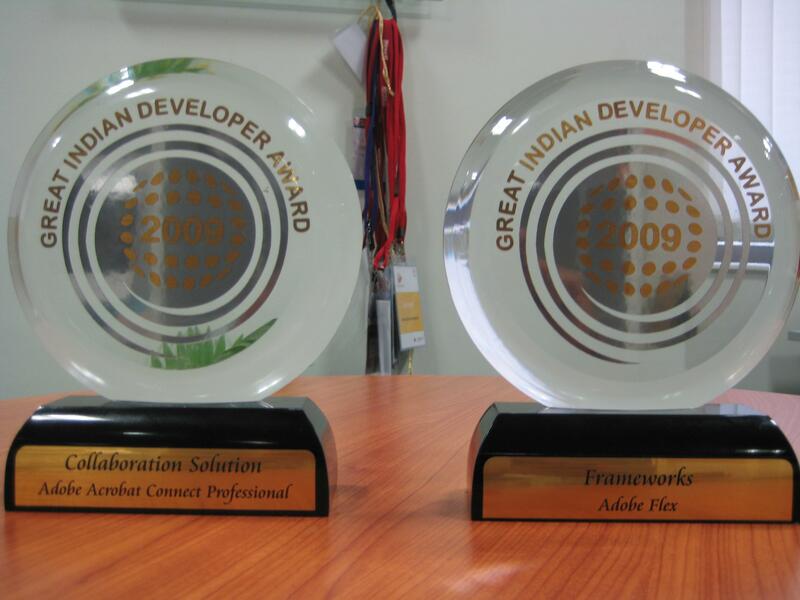 Adobe won awards in 3 categories at Great Indian Developer Summit (GIDS) 2009. Adobe Flex for Best Framework, Adobe ColdFusion for web development and Adobe Acrobat Connect Professional for best Collaboration Solution. Sorry couldn’t get ColdFusion award in the picture. Nominate from groupware, real-time conferencing and collaboration, and digital communities. Nominate from web development and deployment tools that are helping developers and designers push the boundaries of the web. Nominate from across the several libraries, components, and frameworks that are part of every developers treasure chest. This article explains how to setup BlazeDS for your J2EE web application. BlazeDS adds a lot of power to your web applications. You can expose your Java classes as Remoting services. You can use the Messaging service of BlazeDS to expose publish subscribe messaging destinations and also use the Proxy service to invoke other services. Extract the content in blazeds.war file into a folder called blazeds. You can extract the content using tools like winzip. Now we have downloaded and have the required files extracted to setup BlazeDS for a web application. Let’s create a web application. Create a web application named samplewebapp. You do this by just creating folder named samplewebapp under webapps folder. We will setup BlazeDS for the web application created in the previous step. Now that you have BlazeDS set up you can try invoking Java methods from your Flex applications or create a simple chat application. You can find articles at the URLs below. You are currently browsing the Sujit Reddy G - The Evangelist blog archives for April, 2009.